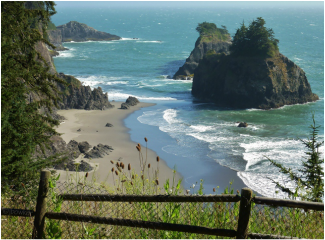 Just one of the many view stops along our beautiful coast! ﻿ A friend gave me an Intarsia fish he had made for my birthday in 2007. Well I was hooked! Intarsia was something I felt I would enjoy. I purchased the necessary tools that December and by January, I was working on my first project; a nine-piece whale. Once completed, I knew I had found my wood craft. The hard woods used in my projects come from all over the world. The beautiful color of the wood is only enhanced by the clear finish I use. Stain is rarely used, but if needed to achieve a specific color, that information will be indicated on the back of my projects. My wife, Judy, photographs my projects and you'll find samples of her photography on her web-site. An art or technique developed during the Renaissance. It is an artwork that has almost been forgotten, but now is gradually coming back. Pieces are separately, delicately and carefully cut, shaped, sanded and then assembled into a mosaic, fixed onto a back and finished for display. Today, Patterns may be purchased or designed by the artist. Most develop their own techniques and styles specific to them. Subjects are often of animals, flowers, scenic or of structures and may be geometric or whimsical. Festival of Art in Stout Park - Aug. 3-4, Brookings, OR - One block off Hwy 101 on Oak St.